Keeping a healthy blood flow to the scalp stimulates hair growth. Keeping your hair and scalp clean will increase the circulation which will in turn increase the growth of thicker, healthier hair. Many shampoos leave residues that clog the pores of the scalp or irritate the scalp. Look for a shampoo that does not leave a residue. Another clogging culprit is dyhydotestosterone (DHT). 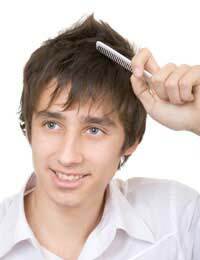 DHT is the genetic culprit of male pattern baldness. This substance restricts blood flow to the hair follicle and the restricted blood flow causes hair to fall out. Finding a shampoo that can remove dyhydotestosterone can reduce or slow down hair loss. Some of the ingredients that can break down DHT are azeleic acid, saw palmetto, and zinc sulfate. Thermal Protectors - contain polymers that protect hair from blow drying, hot curlers, straightening irons, etc. Glossers - contain silicone-derived oils to make hair shine. If your hair is turning grey and you've decided that your look decidedly old rather than distinguishingly mature, you may want to return to your former colour. Using a hair dye could be the solution. Hair dyes, whether for men or women, are available as permanent, semi-permanent, and temporary colour products. Permanent hair dyes, the most popular choice, come in two categories: oxidation and progressive. Oxidation hair dyes consist of dye intermediates and preformed dyes in an ammonia solution that also contains soap, detergents, and conditioning agents; and hydrogen peroxide in water or a cream lotion. The ammonia dye solution and hydrogen peroxide solution are mixed shortly before application. The applied mixture causes hair to swell, whereupon the dye intermediates and preformed dyes penetrate the hair shaft, chemically react with each other and the hydrogen peroxide, and dye the hair. Progressive hair dyes contain lead acetate or, less commonly, bismuth citrate as the active ingredient. Progressive hair dyes gradually change the colour of hair by reacting with the sulphur of hair keratin, and also by oxidizing on the hair surface. You should be aware that there is some question about the use of lead acetate in progressive dyes. Some researchers are concerned about the danger of lead contamination to users and their children, while professional colourists say lead-based dyes can cause scalp burns if oxidation dyes are later applied to treated hair.